CRR looked up from the grocery ads and said these fateful words, “(Big grocery conglomerate) has sweet corn, 10 ears for $2.” He had my attention at “sweet corn,” and the amazing price sent me straight to the store. I know it’s not local, duh, it was trucked here from Florida, violating every locavore rule. But even this liberal arts major can do simple math. Twenty cents for a little taste of heaven? Sweet corn is one of those foods that takes me back home. My father had acres of sweet corn, harvested in August (!) and savored with butter, salt and pepper at the picnic table, so we could let the juices drip down our chins and forearms with abandon. As our children grew up, annual vacations to Rehoboth Beach were capped with a stop at one of the scores of farm stands that sold picked-that-day produce, including the amazing Silver Queen corn. The loamy Delmarva soil was perfect for corn and melons, and we feasted when we arrived home, hot, sunburned and hungry. A few optimists have tried to grow sweet corn in our community garden, but it’s a fool’s errand: too few stalks, a handful of ears, often eaten by the raccoons before they were ripe. So let’s leave sweet corn to the real farmers. I’ll buy the local corn when it’s in season, and pay a few extra cents an ear for it, gladly, for their effort. Everyone has their own recipe. We have friends who grill their corn – in the husk, or in tin foil. Some season their corn with Old Bay, or chili pepper. I favor my mother’s simple recipe. Fill a large pot with water, add 1 teaspoon of salt and 1 teaspoon of sugar, bring to a boil. Add the corn, simmer for 10 minutes. Barely season with butter, salt and pepper, and sink your teeth in. 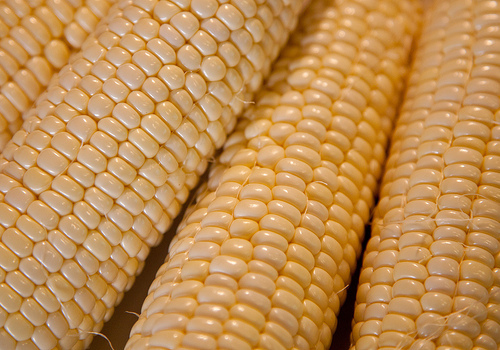 My father always grew corn in our garden in Arlington, and it was the most wonderful thing ever. When it was finally done, we would go out and pick the spent stalks to chew on for that wonderful burst of sugar.